Buy a Home and Receive a Golf Membership – Limited Time Offer! Davidson Realty has teamed up with Honours Golf to bring homebuyers a great incentive! 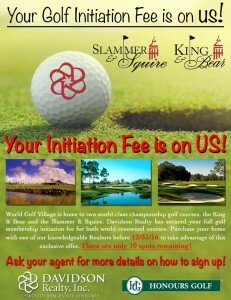 For a limited time, anyone who purchases a home through Davidson Realty can have their initiation fees waived for a membership to World Golf Village’s world renowned golf courses, the King & Bear and The Slammer & Squire. Potential homebuyers have until December 31, 2016 to take advantage of this incredible offer. There are only eight spots remaining! The initiation fee is valued up to $7,000 and can be used for any of several membership options. There are tons of members-only benefits to take advantage of including unlimited use of practice facilities with complimentary range balls, member tournament access, exclusive social programming, preferred tee times and more. To learn more, please contact a Davidson Realty agent at (904) 940-5000 or visit davidsonrealtyinc.com.